Strawberries and Buttercups: Bottle full of Happiness! This year one of my plans is to stay positive which is helped by this little jar. 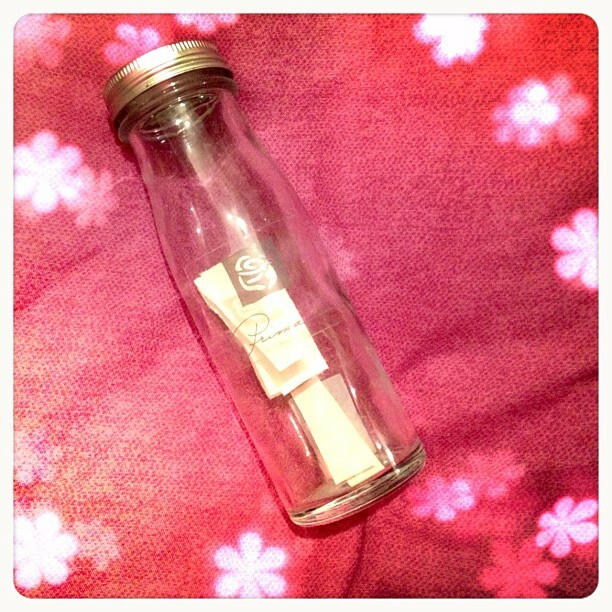 I'm going to try and write all the happy things that happen down on paper and put it in the jar. I'm going to be positive and know that I will do this as I have to admit so many things have happened so far that are pushing my boundaries and buttons... I won't have something for every day but I hope to at least add a little something in at least two to three times a week. I'll have to be on the look out with eyes like saucers for something great to tell you about at the end of the year. Do you think you could start something positive like this? bottle of happiness - and I think about felix felicis from harry potter, it was liquid happiness! haha!